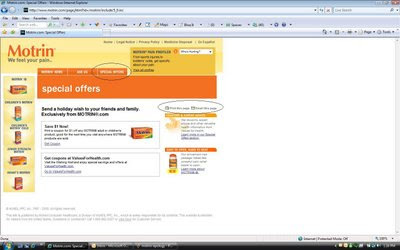 The domain: WhopperVirgin.com is a parked domain filled with ads for Burger King store listings, Virgin Mobile gifts, Virgin Atlantic flights, Virgin Islands vacations and Virgin Mary checks. Search engine optimization: The microsite doesn't appear on the first three pages of Google results for "whopper virgin" searches. Paid search: While reviewing Google's listings over several days, there hasn't been a search ad running on "whopper virgin" queries. Web Analytics Tool Implementation - This site did not have any web analytics code implemented on the landing page. However the video does start as soon as user lands on the site which then fires WebTrends code. With this implementation I am not sure if they are getting an referring site or search engine information. Data Analysis - Clearly Burger King is using web analytics tool. I am sure they were passing the web analytics reports around but I am assume that they were not doing any meaningful analysis. If they were doing any analysis at all they would have uncovered the SEO/SEM issues listed by AdAge. Simple keyword analysis using their web analytics tool would have helped them uncover these issues. (Lesson: If you are spending millions of dollars on the campaign you should also keep aside few thousands for deeper analysis. Just passing the reports around is not enough). It is very common to report on top 10 -20 keywords but these keywords alone don’t tell the whole story. Yes they can be good ego boosters but you have to look beyond top keywords and analyze the keyword that are either in the long tail or are not driving any traffic at all. Doing some basic analysis on search engine keywords would have shown them that they were not getting any traffic (or are getting very little traffic) from “Whopper Virgin” or “Burger King Virgin” keywords (I am sure there are more variations). Search Engine Optimization - Make SEO an Integral Part of your any micro-sites and campaigns (offline or online). Paid Search - Plan to spend few thousand dollars from your campaign budget to SEM to augment or fill any gaps in SEO. Web Analytics Tool Implementation - Plan to spend few thousand dollars from your campaign on Web analytics tools (which they did). Make sure the tool is properly configured to capture the accurate data. As I mentioned above, it appeared that the site did not have any code on the landing page, which means they were missing a lot of data and hence not getting the whole picture. Conduct an accuracy audit of the tool implementation; it can potentially save you millions of dollars by providing you data beyond click-throughs. Data Analysis – Analysis is different from reporting. 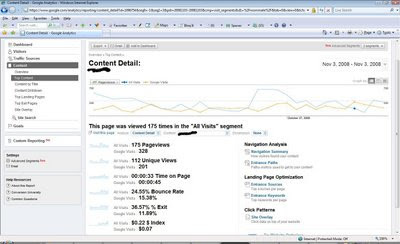 Web Analytics tools and SEM reports just provide you a view into the data. You have to conduct a full analysis to understand what the data means and what actions to take to generate a higher ROI from your campaigns. Plan to conduct an analysis on all the data you collect from various tools. Learn from this analysis, it will tell you where you are wasting your money and what’s working for you. Use the insights gained from the analysis and take appropriate actions to improve your campaigns. Online Reputation Monitoring - Monitor news sites, Social Media (conversations/actions that happen away from your site) etc., look at what people are talking about your campaign and your brand. Learn from it and take appropriate actions. A simple tool like Google Alert can provide this to you this for free. I believe Burger King did pay attention to what was being talked about and as a result now you can see Burger King’s Paid Search campaign for “Whopper Virgin” and “Burger King Virgin” keywords. Are Consumers Paying Attention to your Ads? eMartker reports the results of 2 surveys which show that users are multi-tasking when using the internet. Are consumers watching your video ads when they are already watching TV? Are consumers reading all the text in your ads when they are already reading bunch of other stuff? Are consumer paying attention to TV and Print ads when they are surfing web as well? Are consumers really watching any of your ads? Marketers have to really work hard to cut though all the noise and make their ads stand out to grab consumers attention. Twitter is a free social networking and micro-blogging service that allows its users to send and read other users' updates (otherwise known as tweets), which are text-based posts of up to 140 characters in length. I heard about Twitter from few friends of mine who could not stop raving about it. After initial skepticism about how useful it would be, I joined the bandwagon and started twittering (Micro blogging on Twitter is called Twittering). I post about 1 tweet (post) per day on Twitter. There are some people who tweet all day long (I’m not sure if they do anything else). From my experience so far I can tell you that it is a pretty good tool to learn things you normally would miss, things that you care about. There are a number of people in the Web Analytics, Online Marketing and Advertising space that I follow and I’m always adding more people to follow. Following someone can provide you insight into what they are up to, what are the cool things they read or have come across, and what business challenges they are facing and trying to resolve. You can even learn how they solve these business issues. Occasionally you will see people who tweet about their daily life. Their tweets looks like “I am sipping a cup of Starbucks mocha”, “I am walking into my apartment”, etc. But if you ignore such noise (unless you find it informative) you will find lots of useful information too. What does it mean to follow someone on Twitter? Following: Following someone simply means receiving their Twitter updates. Followers: Your followers are those who have elected to receive your tweets. It really depends on your interest. I started with few people in the web analytics field and my coworkers. Now, I also look at the original tweeters of the re-teewts that come my way and if the person meets my interests, I start following them. I also follow people who are following me if they tweet about the stuff that interests me. If at any point you don’t like what a person is tweeting about then you can just stop following them, it take one click to stop following them. I got this list from the Web Analytics Yahoo Group. Please let me know if I missed your name. If you would like your name to be added to this list then please leave your name and twitter username as a comment and I will update this list. If you are already on Twitter I would like to hear your opinion about twitter. Do you think it has helped you personally or in business or is it a distraction? Resource Interactive is looking for a Director of Analytics. The Director of Analytics is responsible for establishing and managing a digital marketing analytics practice focused on programs for national and international brands. The Director of Analytics will lead a multidisciplinary team to develop an integrated and scalable program to: understand, communicate and evangelize analytics requirements, ensure accurate capture of data for analysis, develop and manage analytics tool set, and conduct data analysis to measure the impact of interactive marketing initiatives. The Director of Analytics will work closely with the RI Account Strategy team and directly with clients to understand and establish key business objectives in order to structure the appropriate measurement, reporting and information delivery strategies and mechanisms. The Director of Analytics must be able to adjust to varying timelines and budgets to maximize the impact of these insights and tools on clients business. The Director of Analytics must also be able to partner with clients to create efficiencies in process and delivery and show commitment to continual program process improvement and evolution. Social Networking sites are used by millions of people around the work and thousands of new users are jumping on social networking sites every day. Almost all of these social networking sites and new entrants are dependent on the advertising to generate the revenue to keep them going. However, a study by BurstMedia shows that consumers have a very low tolerance for online ads. It is not only the publishers who are negatively affected by the ad clutter but also are the advertiser’s products and services. 52.4% respondents has a less favorable opinion of an advertiser when their advertising appears on a web page they perceive as cluttered. A study by IDC shows that the users are less tolerant of Social Networking Services (SNS) advertising than other forms of online advertising. Ads on SNS have lower click-through rates than traditional online ads (on the Web at large, 79% of all users clicked on at least one ad in the past year, whereas only 57% of SNS users did), and they also lead to fewer purchases (Web: 23%; SNS 11%). Lack of ad effectiveness and slowing economy is making marketers cut their spending on Social Networking sites. Market research firm eMarketer has cut Social Network ad spending estimate for 2009 to $1.3 billion down from $1.8 billion it projected earlier. It has also lowered 2008 estimated from $1.2 billion from $1.4 billion. So what should Social Networking sites do? Charge customers for the using the site? Nope, that is not going to work either. A recent AdAge study showed that no matter how much consumers hate advertising but they are not even going to pay for their favorite sites. According to IDC Lower-than-average ad effectiveness on SNS will continue to contribute to slow ad sales unless publishers get users to do something beyond just communicating with others. If the major services succeed in doing so, they will become more like portals, such as Yahoo! or MSN, and they will come closer to the audience reach of the top services. If that happened, publishers would be better able to monetize their SNS. It reduced 2008 to $23.6 billion from its August estimate of $24.9 billion. 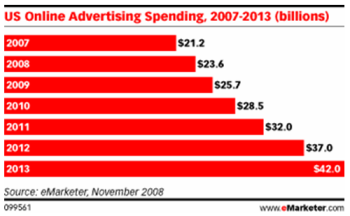 The online ad growth is still increasing and is expected to be 11.3 percent higher than 2007. In 2009 this increase will be 8.9 percent over 2008. Hardest hit is the display advertising, for which the growth rate estimate was cut from 16.9 percent to 3.9 percent. Search ads are expected to grow at 21.4 percent in 2008, its lowest level so far. Next year the search-ad growth rate should be at 14.9 percent, the company predicted, dropping to 10.4 percent in 2013. 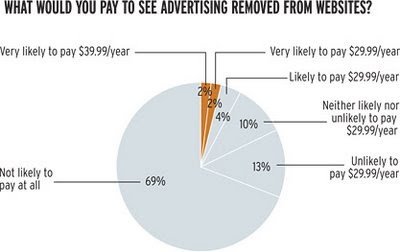 A survey by Ad Age asked consumers if they would be willing to pay $39.99/year or $29.99/year to make their favorite sites ad-free. 69% of them responded with a NO. 82% were unlikely to pay even $29.99/year. Yes, consumers are not willing to pay even $2.50 per month for using their favorite sites. It was not clear how many respondents were for this survey. It is possible that two price point, $39.99 and $29.99/year offered in this survey might be high. It is possible that there is price that consumer are willing to pay to use your site ad-free. You should do you own surveys and test if and what your customers are willing to pay for the subscription. Will you be willing to pay $1.00 per month to make your favorite site Ad-Free? Take a poll on the right side panel of this blog. I invite you to a Web Analytics Association's webinar on Behavioral Segmentation, Targeting and Interactive Marketing that I am doing on December 4th. I will be joined by two very intelligent and highly respected personalities in web analytics and interactive marketing space, Gary Angel of Sephonic and Akin Arikan of Unica. Gary Angles co-founded Semphonic and is president and chief technology officer. He’s responsible for leading Semphonic’s development of Web analytics and SEM decision making tools for web marketing professionals. Read Gary's blog at http://semphonic.blogs.com.
" 5 Do’s and Don’ts for Behavioral Segmentation, Targeting, & Interactive Marketing"
The saw to a carpenter is as vital as segmentation is to a web analyst. Without segmentation, reporting can hardly be called analytics. Behavioral segmentation lays the groundwork for behavioral targeting which automates the process of turning insights into action. Using both behavioral segmentation and automated targeting, the online marketer can truly begin to be interactive - driving a timely dialog between the customer and company which build on the individuals past and current online behaviors. Please join me, Gary and Akin on December 4th at 12:00 Noon EST. I got an email this morning from Facebook that they have lost my email notification settings. I did not believe that email, I thought it was a phishing email. I checked the url in the email and it seemed valid but for some reason I still could not believe it. “How can Facebook lose my email notifications? Not possible” I thought. I logged into Facebook and found the same message on the home page. So, the email was legit and Facebook had indeed lost my email preferences. It is very concerning to me. How can a company like Facebook lose data? Millions of people put a lot of data on Facebook and how can Facebook not keep proper safeguard to make sure data does not get lost and proper backups to restore the data. It is not clear if a programming error or human error cleared all the data or did somebody break into the database/file system and cleared it out. I am not sure if it was just me or others got affected as well? Did you receive similar message from Facebook? Motrin Ad Controversy - Who Gained from it? Last week there was a lot of uproar in the social media space about a Motrin Ad that caused Motrin to pull the ad within 2 days of launching it and post an apology on their site. Judging by this and the negative press it got, it seemed like a failure. However, in my last post I outlined few key measures to see if the ad was a success or a failure. As I expected, Motrin site saw a huge increase in traffic on its site. According to Compete Pro Motrin’s site saw a 10X increase in its Daily Reach on the Web, jumping from .002% to .02% in one day. That is a huge. An ad without a controversy would have not generated that kind of traffic. Motrin should send a big thank you and some motrins to #motrinmoms , a twitter group that started this whole controversy. Note: 15th evening is when the ad went live and by 17th evening they pulled the ad and posted an apology. #motrinmoms, you were successful too because you got the ad pulled out and got an apology. Now go take some motrin to ease the pain caused by this ad, don’t forget to print a coupon at Motrin. Was Motrin’s Baby Wearing Ad a Failure? Last week, Johnson & Johnson’s video ad for Motrin caused a lot of uproar in the media. There were a few moms, dads and media upset with this ad and voiced their opinions on blogs, twitter and other social media. But there were also many who voiced their opinion on the social media and said they did not see any issue with the ad. It was amazing to see how the negative voice of few people carried such a huge weight (as it does most of the time) that Motrin was forced to remove the ad and post an apology on the home page of Motrin.com. So should we say that this ad was a failure? It sure does seem like it, doesn’t it? However, in my opinion, there are several ways to look at it. Let’s look at various KPIs and see if the Motrin ad was a success or failure. Buzz created – Huge. A lot of buzz was created. The blogosphere, Twitter, Social Media, TV, Newspapers - everybody was talking about it. Honestly, I never even considered Motrin when I was looking for pain killers, but now I know it is another option made by Johnson and Johnson. Also, some people have told me why Motrin might be better than the other pain killers I have been taking. Buzz Sentiment – Yes, there was a lot of negative press about this ad that forced the ad out (there were a lot of positive sentiments as well) . I am not sure if opinions about an ad from Motrin would really impact Motrin’s brand image that much. A lot of people I talked to did not view this ad negatively, but also did not voice their opinion in any social media so their sentiments were not taken into account. Yes, all sentiment measures will show an issue, but is there really an issue with the product or was the issue just with an ad? If you just look at the buzz sentiment in isolation then this ad appears as a failure. Brand Awareness – A lot of people, like me, who never even considered the Motrin brand before, became aware of it. I think this is a huge positive. Change in visits to the site from pre-video launch- I am sure it was a great success. I am sure a lot of people went to the site to see what all the fuss was about and to read the apology by Motrin. The apology got the blogosphere and social media world buzzing again driving even more traffic to Motrin’s site. Change in Motrin Sales – This will really tell us if the ad and this backlash had any negative (or positive) impact in Motrin or not. As I asked above, was the backlash against Motrin, or just against the ad? If it was the ad then they apologized and took the ad away. The product “Motrin” did not have any negatives attached to it. As mentioned above, a lot of people might have to gone to the site. If you look on Motrin’s site there is a link on the top called “Special Offers”. You click on that link and get a coupon with the option to forward the page to a friend. I am sure that this increase in traffic would have resulted in an increase in coupons being printed and forwarded to a friend. This in return will possibly drive more sales. This seems like a success for Motrin. In the future when Motrin comes up with a new ad they’re automatically going to get some additional coverage. I think that also makes the Baby Wearing ad a success. Free publicity; what more can you ask for? So what do you think was it a success or a failure? We, the people in the business of marketing and optimization, know (I hope) that certain images, text, ad copy etc. work better than others in driving user to convert on our sites. We continuously test (A/B and Mult-variate) to see what works and what does not work for our visitors/customer on our sites and then optimize our sites/banners/emails etc. accordingly. In order to make users click we test headlines, text, testimonials etc. making certain claims about our services, and products in those headlines, ad copies, emails etc. In making those claims we need to think responsibly. We need to make sure that we do not go over broad and make false claims, promises or exaggerate the results. Yes, those claims might give you higher click through rates and higher conversions but there is one more KPI that you need to keep in mind i.e. the KPI that measures responsibility (both ethical and legal). We need to all think ethically and legally about all the claims we make. Think about how we will feel if another company made such claims and we fall for it, will we feel cheated or not? Think about the potential of lawsuits. “The plaintiff, Anthony Michaels of San Diego county, alleges that he signed up for a free membership to the site last Christmas Eve, but then upgraded to a paid one after receiving e-mail ads stating that other schoolmates were trying to contact him. Those statements turned out to be false, according to the lawsuit. Michaels' lawyer, Brian Kabateck, said his client had no way of verifying whether his former schoolmates were actually seeking to contact him on the site, short of signing up for a one-year membership. "The e-mail said: 'So and so's trying to find you, and in order to hook up with him you have to join and become a gold member,'"
Media Post further reports that Reunion.com also faces a lawsuit by members complaining about the site's marketing efforts. In that case, filed in federal district court in San Francisco, the members allege that Reunion.com sent e-mails that appeared to have come from specific friends, but were actually sent by the site. We might (or might now) find out if the claims by classmates were false or not. Either way this lawsuit provides a great lesson for the marketers - Market and Optimize Responsibly. 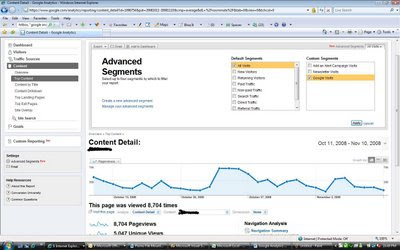 Last month Google Analytics released Advanced Segmentation functionality. I am very impressed with it so far, however this functionality is still in beta, which means it could potentially have some issues. In this post I will show you how to create an advanced segment and one issue that I found with it. Business Problem: I want to see all the data for visits that originate from Google. Solution: Create an Advanced Segment that will have all the visits that has the source as google. Let’s see how to create such a segment. (Not this is a very simple segment but the same steps can be used to create more complex segments). 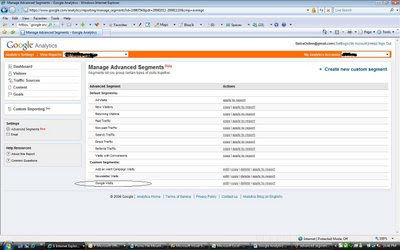 Click on the "Advanced Segments" link on the left navigation bar under the “Settings” section. In the next screen you will see all the "Advanced Segments". In this screen you manage all the advanced segments. Google Analytics has predefined some of the segments and they are grouped under "Default Segments". The segments that you create will be listed under "Custom Segments". To create a new segment, click on the “Create new custom segment” link on the top right hand corner. The next screen is where you create the segment. The segments can be created by using one or more dimensions and metrics. On the left hand side you have 2 sections "Dimensions" and "Metrics". I chose a dimension of "Source" listed under "Traffic Source" as I wanted to see all the visits which originated from Google (i.e. the source was Google). I chose "contains" as the condition as I wanted to get all the visits that originated from anything that contained Google in the source. Finally I entered the word "google" in the value. Click on “Test Segment” button to do a sanity check and see if the segment size is as expected. Once you are satisfied with the segment, give it a name in "New Segment" filed and click "Save Segment" to Save the segment. Once you the save the segment you will be taken back to "Mange Segments" where your new segment will appear. See below, a new segment called "Google Visits" show up. The new segment is now ready to be applied to various reports. So far so good. However, I found one potential issue with the data. I applied this segment to one of the pages in my Content Report (see below) and chose the date as Nov 3rd. As you can see my "Google Visit" segment is reporting 328 pageviews while my "All Segments" is reporting only 175 pageviews. That does not seem right. Similarly Unique Views is 112 for "All Visits" while 201 for "Google Visits". As you can also see from the graph, "Google Visits" are higher than "All Visits" on several dates not just November 3rd. Has anyone else seen something similar? Am I not reading these reports correctly? Unica Corporation is looking for an experienced Professional Services Consultant to install, configure, optimize and provide web marketing consulting services relative to our NetInsight Web analytics solutions on-site at our customers' facilities. To be a successful Professional Services Consultant you must be a self-starter, capable of working with minimal guidance in a diverse set of environments. You must be a quick learner with strong analytical skills accompanied by a strong desire to learn new tools and techniques. You must be capable of communicating with both technical and non-technical audiences (administrators and end-users of our software), as well as with our internal sales representatives. The ability to build rapport and develop effective working relationships with clients is essential. This position requires extensive travel and is based in our Waltham, Massachusetts headquarters. • Functional experience in at least 3 scripting languages: Perl, Bash and VBScript preferred. This position requires approximately 75% travel and is based in our Waltham, Massachusetts headquarters. Should You be Freaking Out about your Analytics? Tracking the Spikes and Dips. This Blog Post is written by Aaron Lovelace. Aaron is an Analytics and Optimization Analyst on my team and he will be guest blogging on this blog. One of the challenges in web analytics is knowing whether a spike or dip in web metrics is something to be worried about. One common way that we deal with knowing whether to ‘freak out’ or not is to conduct a historical baseline analysis. Now, if you are a WebTrends customer, there is an easier and less time consuming way. But first, let me explain how we normally go about it so that you can fully appreciate the new development. For any given site, our team typically maps out historical trends and create a set of standard metrics to measure against. We call this process a "baseline analysis." These baseline metrics can then be used to determine whether what we are seeing in our analytics is normal or not. If you do this type of baseline analysis on your site and you notice that your metrics are abnormally good, you can turn whatever caused the spike into a best practice. If your metrics are unusually bad, try to avoid whatever caused the problem in the future. Easy enough, right? Well, sort of. It is easy to see that conducting this type of research is a necessity if you are serious about success, but that doesn’t change the fact that it is a time consuming and laborious process. If you hire a consultant to do a baseline analysis for you, it could get expensive. So here is the good news— there is a now faster and more accurate way to track spikes and dips in WebTrends… and to know if you should freak out about them. WebTrends recently announced a new service (through a partnership with Technology Leaders) called “Dynamic Alert.” Among other things, Dynamic Alert allows you to track spikes and dips that deviate from your website’s historical norms automatically. It should be noted that SiteCatalyst has a feature called simply "Alerts" which allows you to be notified if your metrics exceed a pre-set metric that you specify. With Alerts, you still need to do a manual baseline analysis to figure out which number(s) to enter in the Alerts configuration. This is what is so great about the new WebTrends tool—you don’t need to pick a number, it just does it for you by automatically analyzing your historical data. One feature I would like to see, however, is the ability to integrate with other analytics tools beyond WebTrends. Keep an eye out for more information from WebTrends and Technology Leaders about this useful new tool. Although Dynamic Alerts was developed by a partner, if you sign-up through WebTrends, your bill for this service will just be added to your regular WebTrends bill. Let's begin with a profile of a customer who received an email from a large retailer. Shopping Habits: Shops at Nordstorms.com, mostly interested in shoes and have borught a lot of them from Nordstorm.com. Also buys shirts, trousers and other male clothing items. Loyal customer at Nordstrom.com and Nordstrom for many years. Has an account online and login quite often when browsing. From what it sounds like he is a perfect customer for any male clothing items that Nordstorm wants to sell. He will be very keen to look at Nordstrom promotions. He has opted-in for an email from Nordstrom. Now my questions to Nordstrom or other etailers who are sending similar emails is, “Why would you do that?” You have so much information on your customers (John in this case) why not use that information to power your emails? 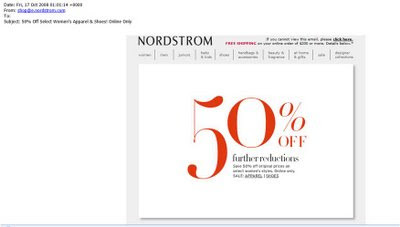 John was not annoyed with Nordstrom for this email(he is a huge fan of Nordstrom. Good for the brand.) but he was disappointed. He would probably have bought something if Nordstrom had sent something relevant to him in that email. Here is a customer waiting to convert and you are disappointing him with irrelevant emails? Why? Don't you want happy customers who are ready to open their wallet and give you money? Don’t waste your and his time with irrelevant emails send them relevant emails. Sending relevant emails is not rocket science. Most of the email tools/services have a way to send highly customized emails. You just have to explore them. Do you have examples of irrelevant emails or relevant emails that you would like to share? Send them to me. Akamai, a content delivery network with relationships with publishers, ad networks and advertisers across the internet, is getting in to behavioral targeting with the purchase of acerno. Akamai bought acerno for $95 million. Acerno uses shopping cart data to predict what the consumer is interested in buying next. Acerno network reaches nearly 100% of online shoppers in US. The combined solution will use browsing data available from Akamai with the shopping data available from Acerno to deliver behaviorally targeted ads to the consumers. Like most of the other behavioral ad networks this system claims to be anonymous. 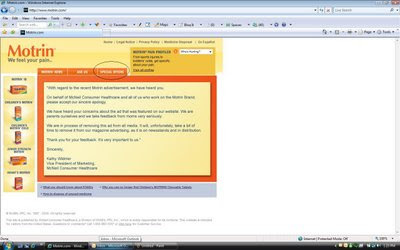 What makes Akamai Behavioral Targeting Different from others? I am sure Akamai will face the privacy concerns unless it is proactive and make it a truly opt-in system, as I proposed in my 5 Step Process to ease Privacy Concerns. Due to stiff competition in behavioral targeting network space, recently few of the behavioral targeting networks have closed their doors. Akamai sure does have a better reach than a lot of Behavioral Targeting networks out there. Akamai’s new venture might further cause some other Behavioral Targeting networks to go under as well, provided it can ease the privacy concerns. I am heading off to D.C. tomorrow morning to attend eMetrics. eMetrics Marketing Optimization Summit is the a premier conference for Online Marketers and Web Analysts. It is a great place to learn from and network with online professionals from around the world. Behavioral Targeting is a topic that I cover extensively on this blog and have spoken on at past eMetrics. In this session I will talk about the benefits of BT to consumers, publishers (site owners) and advertisers. I will show what vendors are available to help with different types of BT and review various aspects of BT, from the available technologies to the tried and true techniques to the preponderance of privacy pains. I will also present 5 step process to successful Behavioral Targeting and is not just limited to online advertising but also how these techniques can be used for onsite advertising and content and product targeting as a part of onsite campaign and email marketing. If you are going to attending eMetrics, I would love to meet with you. Look for me there or drop me an email (batraonline at gmail.com) with your phone number. Gray Angel, Tim Ash, Douglas Brooks, Jason Burby, Joseph Carrabis, Terry Cohen, Matt Cutler, Justin Cutroni, Bryan Eisenberg, Vanessa Fox, Bill Gassman, Andrew Goodman, Rob Graham, Ann Green, Mike Grehan, Stephane Hamel, Alex Langshur, Pat LaPointe, John Lovett, Neil Mason, Jodi McDermott, Liz Miller, David Millrod, Angel Morales, Jim Novo, Bob Page, Katie Delahaye Paine, Todd Parsons, Laura Patterson, Eric Peterson, Michael Stebbins, Robbin Steif, Pat Stroh, Jennifer Veesenmeyer. See you guys in DC. All respondents will receive a top line report of the results of the survey. I will also post the results on this blog. If you are currently engaged in Behavioral Targeting, this is a great way to contribute to a report that will clarify the state of behavioral marketing today. IndexTools was bought by Yahoo earlier this year and yesterday they rebranded themselves as Yahoo! Web Analytics. The re-branding also includes the launch of a new website and changes to the analytics product itself. It also includes a few enhancements to the tool, beyond making it scalable and compliant with the Yahoo! stack. From a user perspective, the first most noticeable fact is that we are moving to a single sign-on provided by Yahoo! and your account will be tied into your overall Yahoo! account. And for these, this is not just random access as in handing out 15000 logins, but well thought through integration with the platforms themselves. If you e.g. are a Yahoo! store owner you can enable enterprise-class web analytics by simply ticking a box and we then automatically inflate the correct tracking script variables at runtime. You are of course allowed to turn this off and take control yourself if needed. If you are a developer you will probably not even notice that it is us, as we fully instrument on the fly and create reports through the YWA API. All very exciting stuff I will elaborate on in future posts. Yahoo! Web Analytics will be released in stages to various business units and eco-system partners! Some blog posts and articles (e.g. Yahoo Web Analytics claims faster updates than Google Analytics) are comparing Yahoo! Web Analytics to Google Analytics. In my opinion this tool is a lot better than Google Analytics and there is no real comparison between Google Analytics and Yahoo! Web Analytics. Yahoo! 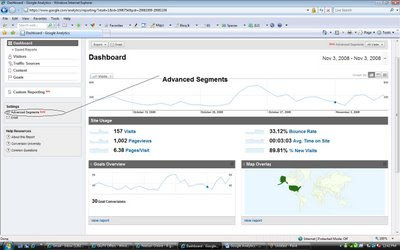 Web Analytics (IndexTools) compares more to the likes of Omniture SiteCatalyst, WebTrends Analytics etc. There are a lot of Omniture, WebTrends, Coremetrics customers who do not use (or need) the full functionality of these tools and Yahoo! Web Analytics tool could be great fit for these companies. But how do you get Yahoo! Web Analytics? ZeroDash1 (now Ascentium) is Yahoo! Web Analytics partner and can get you started on this tool. If you are interested in learning how we might save you thousands of dollar on web analytics tool email me at batraonline at gmail.com, make sure to put “Yahoo! Web Analytics” in your subject line. According to Nielsen Mobile the adoption of the mobile web has reached a critical mass. Nielsen says that, as of May 2008, 15.6 percent of mobile subscribers in the US make regular use of the mobile Internet on their devices, totaling some 40 million subscribers. This is just a subset of the 95 million US mobile subscribers who pay for access to the mobile Internet (through data plans or some other setup) but don't use it quite so regularly. Despite such a surge in mobile internet usage business are lacking in measuring the mobile traffic. A recent survey by Omniture found that 71% of businesses are not measuring mobile traffic to their sites. It also found that 50 percent of businesses do not even know how many unique users landing on their sites originate from a mobile device. Measuring Mobile internet traffic, also called “Mobile Analytics” is not easy, we are still dealing with the accuracy issues with web analytics and now Mobile analytics provides its own set of unique challenges. Judah Philips in his post on Metrics insider covers a comprehensive list of challenges that Mobile Analytics faces. 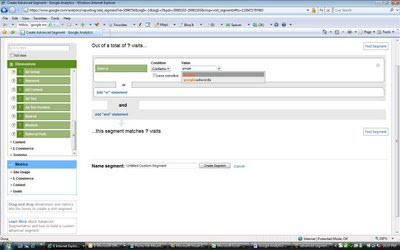 Unique visitor identification - due to lack of cookie support and the changing of IP addresses it is a challenge to uniquely identify a user. Traffic source detection - Determining the source of traffic, such as search, email, direct entry, RSS feeds, and marketing campaigns can be challenging in the mobile space. Geographic identification - Where are the visitors viewing your site coming from? But not all devices enable geographic detection because the gateway’s IP address is used, not a GPS signal. A lot of Mobile Analytics solutions have sprung up in past year or so and more are coming up (See my prediction for 2008). Some of the established web analytics vendors are also now offering Mobile Analytics solutions. These solutions widely differ in their technology, process and capabilities. Which solution will work for you will depend on your needs (In future I might compare some of these vendors on this blog, but meanwhile if you would like help in evaluating a solution you can email me at batraonline at gmail.com). Below is the list of current mobile analytics vendors that I am aware of. We live in a multi-channel world today. Customers are everywhere Online, Print, Mobile, Email, TV etc. Marketing efforts in one channel have an impact on the other channels. Customers interact with various channels before they take the final action i.e. to buy from you. Mutli-channel customer behavior poses a problem for marketers who need to analyze impact of various marketing efforts and decide how to allocate their budget. It is one of the biggest challenges that face the marketers today. Akin Arikan provides a very practical approach to Multi-channel marketing measurement and optimization in his book Multichannel Marketing: Metrics and for On and Offline Success . This book shows how to effectively measure and optimize the multi-channel marketing efforts using web analytics. Akin looks at multichannel measurement methods from web analysts, brand marketer and direct marketers point of view. He then takes these various methods to create cross channel analytics. I highly recommend this book to all the marketers and web analysts. Great Job Akin! Have you read this book? What do you think? Chime-in. Here is a list of other books that web analysts recommend. A friend of mine and a regular reader of my blog asked me about the resources that are available for someone to learn about Behavioral Targeting. Since I get a lot of questions via emails, I thought that I should answer it via a blog post so that others, who might be interested in the same topic, can benefit from it as well. With this post I am also officially starting a column called “Ask Anil Batra”. Please send me your question on Web Analytics and Behavioral Targeting and I will try to answer them in my blog posts. ClickZ – Behavioral Marketing Articles - Another great resource that I read. Behavioral Targeting vendors have a lot of information and whitepapers on their own sites. I will do repost in future with a list of vendors and any whitepapers that might be of value. If you are a Behavioral Targeting vendor and would like to be included in this list then please contact me. If you know of a resource on Behavioral Targeting then please leave me a comment or email it to me and I will add it in my future post. Got a question on Web Analytics, Optimization or Behavioral Targeting? Send it to me at batraonline (at) gmail.com. Online privacy is a hot button these days. Privacy advocates and lawmakers are putting a lot of pressure on several large internet companies such as Google, Microsoft and Yahoo to be transparent about how they intend to use users web surfing data (behavior). Mainly they are concerned with the companies that collect a huge amount of user data and then engage in Behavioral Targeting. However online data tracking is not limited to companies who engage in Behavioral Targeting. Any companies which collects users’ web surfing data or user provided data needs to make sure do not compromise user privacy (actual or perceived). They need to clearly state how they are collecting data and how that data will be used. Enterprise web analytics tools like Omniture, WebTrends, Coremetrics etc and free tools like Google Analytics and Yahoo IndexTools have made it very easy for website owners of any size to track users’ online behaviors. Most of the web analytics tools use a first party anonymous cookie to track users and their behaviors on any given site. Side Note: The data is called anonymous because it mainly uses a cookie value to indentify a user (there are other ways which I am not covering in this post) without knowing who the actual user is. Say John Doe arrives on AnilBatra.com, a web analytics tool will drop a cookie with a random id say 123ASXBA12. This cookie id is not tied to any personally identifiable information (see below) of John Doe. So Web Analytics tools (in most cases) do not know who the person is, they just know that cookie id 123ASXBA12 came to the site. They use this id to track current and future site visits. It does not matter who is collecting the data. The data is collected on your site and is collected on your behalf so you are responsible for clearly stating how you are collecting and using the data. I am a big supporter of giving users an opt-in option before using PII data for tracking and targeting. If you do decide that opt-in is not the right for your business model then at least provide an easy way for users to opt-out from being tracked and targeted using PII information. You will not (and will not allow any third party to) use the Service to track or collect personally identifiable information of Internet users, nor will You (or will You allow any third party to) associate any data gathered from Your website(s) (or such third parties' website(s)) with any personally identifying information from any source as part of Your use (or such third parties' use) of the Service. Google Analytics even considers IP address as PII. It uses IP address to populate Geo Report but will not show IP address in any report. 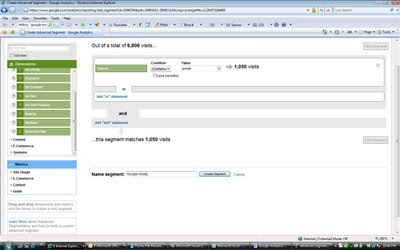 Other tools such as Omniture, WebTrends etc. can display IP and other PII data. As marketers and web analysts lets do our part, let’s make sure to be clear and forthcoming in our privacy policies. Also see Jim Stern’s view on giving users the control on privacy.